The dispute around Babri Mosque seems to be unending. Just weeks ago we saw Sri Sri Ravishankar, the well known founder of ‘Art of Living’ stepping in to settle it ‘out of Court’. Now RSS Chief Mohan Bhagwat (24th November 2017) has made a statement that only Temple will come up in Ayodhya. His assertion is just the repeat of RSS stand on the topic, which is despite the Allahabad Court judgment. As far as Sri Sri Ravishanker is concerned he is regarded as a spiritual person but at times he jumps into political issues. Earlier; one heard of his intervention; was at the time of Anna Hazares anti-corruption upsurge. This time around Sri Sri is back on the political chessboard. He has already met the UP Chief Minister and plans to meet many local religious leaders from Hindu side. As such the Ayodhya matter is pending in the Supreme Court following the appeal by disputants. The Allahabad Judgment had divided the land, where Babri mosque was standing into three parts. One part to Sunni Waqf Board, one to Ram lalla Nyas and one to Nirmohi Akhada. The judgment primarily resorted to the fact that it is the ‘faith of Hindus’ that Lord Ram was born at the spot, so those two thirds were given to those representing the Hindu side, while Sunni Waqf Board has been given one third of the land. Now both Hindus and Muslims are claiming that whole land belongs to them alone. As country got Independence, the land was under the possession of Sunni Waqf Board. On the night of 22 December 1949, some miscreants, belonging to pro Hindu groups, entered the mosque illegally and installed the Ram Lalla Idols in the mosque. Pundit Nehru, the then Prime Minister of the country wrote to the Chief of UP Government, Govind Vallabh Pant to get the idols removed immediately. The local Magistrate K. K. Nayyar, who later contested elections for MP on BJP predecessor Bharatiya Janasangh ticket, did not get the idols removed. The gates of mosque were locked. Under the pressure of rising Ram Temple movement the locks were removed and Shilanyas was performed when Rajiv Gandhi was the Prime Minister. This was in the aftermath of Shah Bano Judgment reversal by the act of Parliament. In the aftermath of this; RSS Combine intensified its campaign of ‘appeasement of Muslims’ and got support from the sections of Society. It is around this time that BJP’s Lal Krishna Advani, made Ram Temple as the central part of his political campaign. In the aftermath of implementation of Mandal Commission report by VP Singh, BJP intensified its campaign for Ram Temple and Advani’s Rath yatra left a trail of communal violence and led to deeper polarization of society. 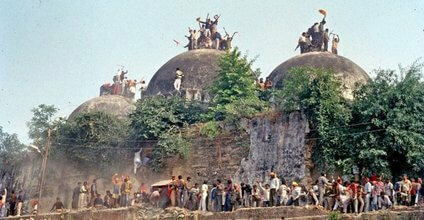 This polarization and later attempts by RSS combine led to demolition of Babri mosque on December 6, 1992. The installation of the Ram Lalla idols was a crime and the guilty went unpunished. The demolition of the mosque was a crime and its culprits went on to become politically more powerful, Advani as Deputy Prime Minister, Murli Manohar Joshi and Uma Bharati occupying high political offices. Liberhan Commission report highlighted some of the factors leading to demolition. Advani and Company is facing the charges of criminal conspiracy in the Courts. In the past the criminal acts related to Babri Mosque have paid rich political dividends to those who were part of illegal acts. The basic dictum is that reconciliation is always good; it is welcome all the time. Despite the nature of the past; out of court settlement is the best option to be sure. But who can do that sort of reconciliation? Can one begin the process of reconciliation without respecting the legal verdict? While many Hindu leaders are welcoming Sri Sri, the Sunni Waqf Board has asked for the solution he has in mind before they can meet him. Also they want to wait for the meeting of All India Muslim Personal Law Board, before they venture to meet Sri Sri. As such while the Hindu side has been harping that Muslims should give up their claim on this land and they will be given land at another place to build a mosque. This becomes clear with the statement of RSS Chief. Shia Waqf Board, though it is not a party to the legal dispute, has shown willingness to yield to the demands of Hindu side. Can a large section of Muslims go along with the present efforts of the like of Ravishanker and the statement of Bhagwat? The answer to this question is difficult as Sri Sri does not seem to be a neutral person. He comes from the category of Modern Hindu Gurus. On most of the matters of social reform he is closer to conservative values. He has never condemned the crime of demolition of Babri mosque; neither did he grieve the massive violence unleashed in the aftermath of Babri demolition. He seems to be partisan to the ideology of Hindu nationalism, while posing to be neutral about it. RSS is adamant on Hindu temple alone at the site as it is the part of their political agenda. In these circumstances what should the Muslims do? The wedge between Shias and Sunnis is being promoted deliberately. While it was a Shia mosque, the Sunni Board has been the litigant. During last three decades, the Muslim community is being relegated on the margins of society due to communalization. In these circumstances, sticking to Legal recourse seems to be the best option for most of them. The likes of Sri Sri in the name of reconciliation will try to promote the solution amicable to those who have been at the forefront of installing Ram Lalla and demolition of the Mosque, both big crimes in a democratic society! Irrespective of the awaited Supreme Court judgment RSS is already asserting for Ram Mandir alone. Hope the highest Court gives a verdict which respects minority rights also.